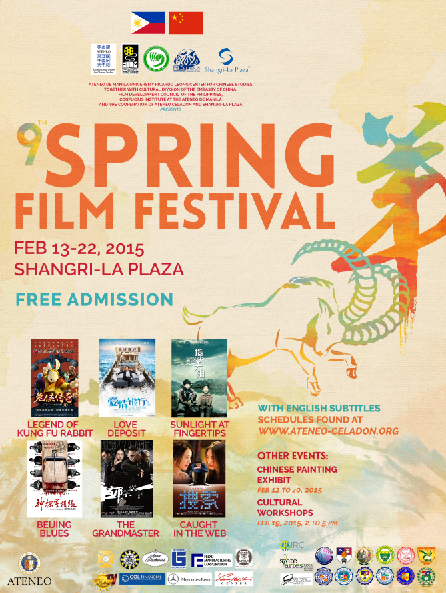 The film festival is organized by the Ateneo de Manila University’s Ricardo Leong Center for Chinese Studies together with the Cultural Division of the Embassy of the People’s Republic of China, the Confucius Institute at the Ateneo de Manila University, and the Film Development Council of the Philippines, with the cooperation of Ateneo Celadon and Shangri-La Plaza. It aims to promote Chinese language and culture in mainstream Philippine society, particularly among young Filipinos, so that they may become bridges between the Philippines and China. Another highlight of the festival is a painting exhibit from February 12 to 20 and a cultural workshop on February 19, 2015, 2:00 to 5:00PM. For more information, please call the Ateneo de Manila University Ricardo Leong Center for Chinese Studies at 426-6001 locals 5280 and 5284. Schedules may be viewed online at www.ateneo-celadon.org. Admission is free.